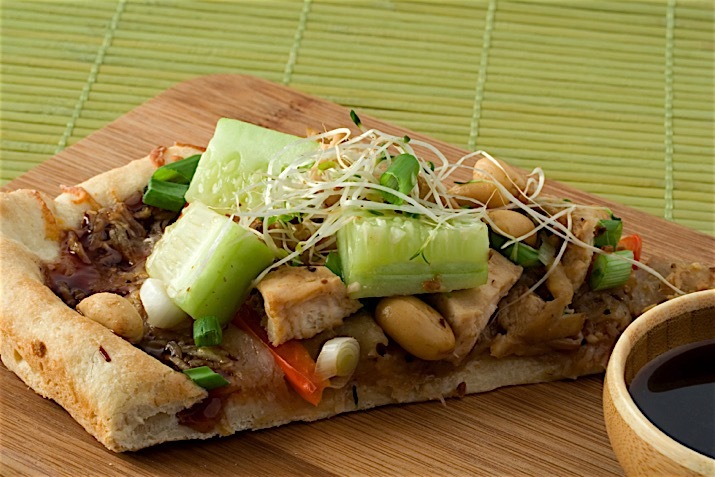 Thai peanut sauce is so popular, with its creamy, nutty taste and hint of spice that it just had to end up on pizza. It also goes well with chicken, shrimp or tofu, so you can always add more heft to this dish by adding some extra protein. Preheat the oven to 400 degrees F. Place the two pizza crusts on a sheet pan. Spread the peanut sauce on the two crusts. Bake the crusts for 10-12 minutes, until hot and crisp on the bottom. Meanwhile, toss the cucumbers, scallions, chile, sprouts and peanuts with the lime juice and fish sauce. When the crusts are hot, top each crust with the cucumber mixture and serve immediately.